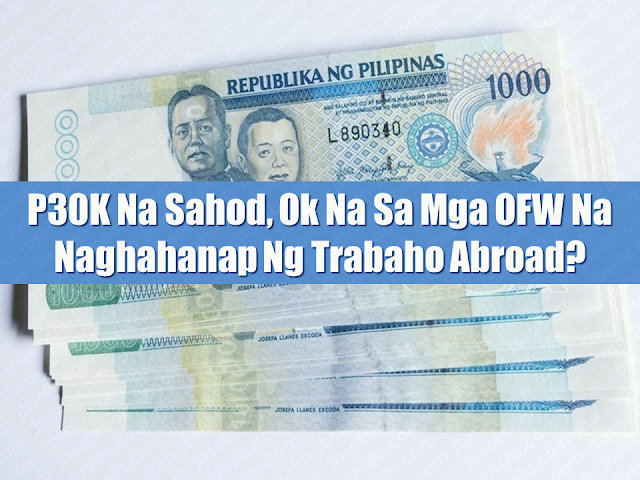 THOUGHTSKOTO Thoughtskoto : OFWs Only Seek To Earn An Average Of P30K Monthly Salary? OFWs Only Seek To Earn An Average Of P30K Monthly Salary? Personal surveys conducted on all 365 households in the study area with 1,555 individuals including minors. The typical household ’s income is P59,990, or $1,421 average. Standard deviation is at P87,625, or $2,075. All the households have access to electricity. In 2015, the bulk of OFWs were deployed to the Middle East (63 %) and various Asian countries (28 %). The rest (9 %) went to Europe, the Americas, Africa and others. The top 3 country destinations of Filipino workers are Saudi Arabia (406,089), the United Arab Emirates (227,076) and Singapore (141,453). 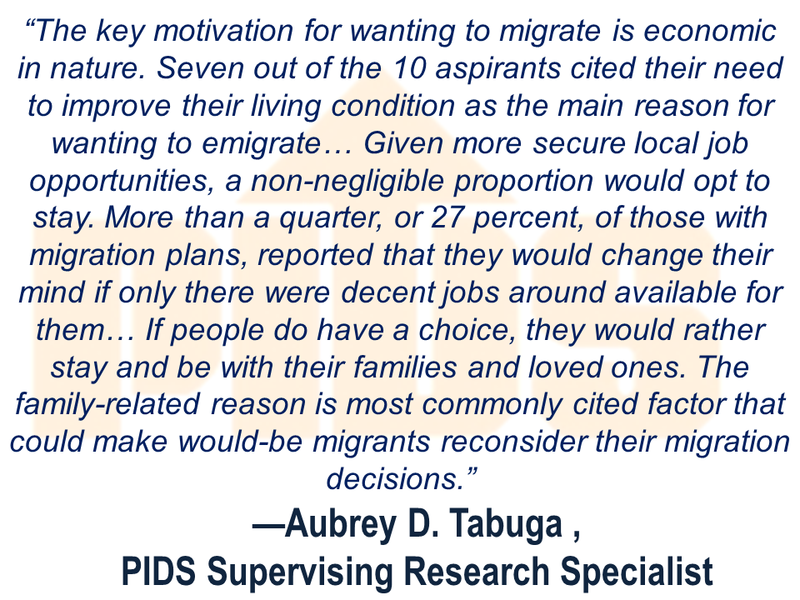 “A Probe into the Filipino Migration Culture: What Is There to Learn for Policy Intervention?” a study conducted by PIDS Supervising Research Specialist Aubrey D. Tabuga said about 40 percent of study respondents even said they are willing to receive even less than P20,000 to work as overseas Filipino workers (OFWs). The majority of Filipinos who are wishing of working overseas are looking for an average salary of only P30,000 or less a month, according to the Philippine Institute for Development Studies (PIDS). 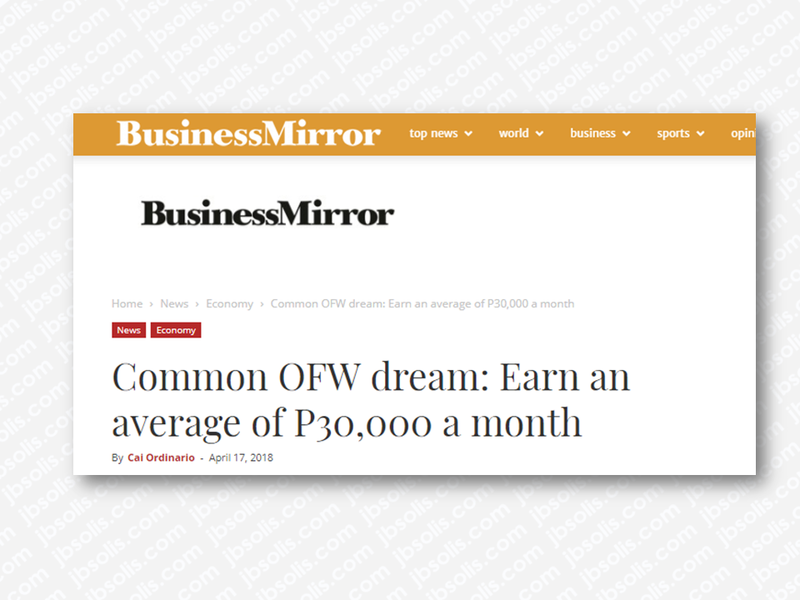 When asked about the minimum amount of monthly pay or wage that they seek in overseas work, Tabuga said the respondents replied they expect to receive compensation from as low as P3,000 to around P280,000 or $67 to $6,000. These economic reasons are based on the underlying dissatisfaction of workers with their current incomes or salaries. The majority, or 50.2 percent, of respondents, also expressed discontent with their incomes. 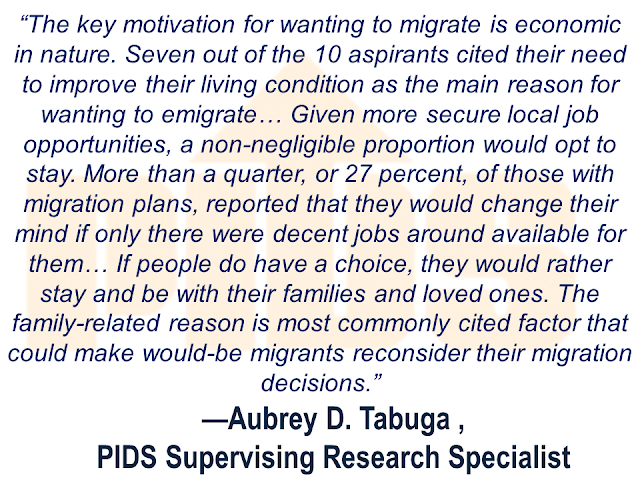 The study also found out that 43% of migration aspirants are not satisfied with their present living condition. Only around 30%of the non-aspirants expressed the same dissatisfaction. With this, Tabuga said the government must focus on regional development to increase employment opportunities in remote areas in the Philippines. 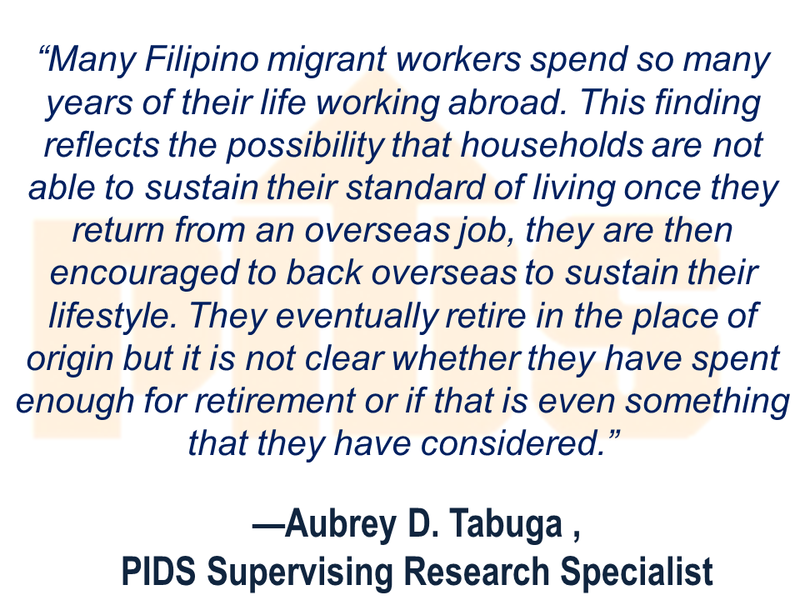 She added there is a need to consider policies that care for the welfare of retirees, including those that allow migrant workers to prepare for retirement. Tabuga said some 11% of respondents expressed the need to improve their career, while around 10% wanted to finance the education of their children and 8% wanted to join with their kin who are working/living abroad. The rest of the respondents wanted to earn more and save for the future and for retirement at 7 percent; to build or repair their own house, 5 percent; and to see the world, experience life in another country. 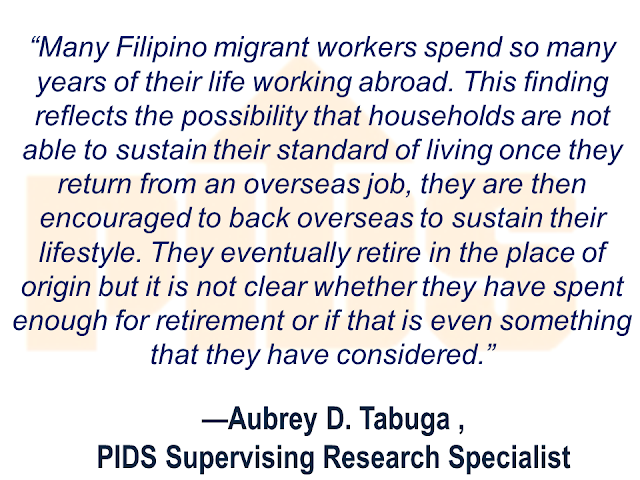 Tabuga, likewise, urged the government to undertake a more aggressive information campaign about migration and implement programs on financial literacy not only for current overseas Filipino workers (OFWs) but also those aspiring to work abroad. She said based on the study, only 3 percent of former OFWs or returnees said they obtained their information from government entities. The rest obtained information from personal and social networks, which could be an indication that the lack or absence of government information on labor migration nationwide, despite the thousands who emigrate daily. The data collection was carried out through face-to-face interviews of all the 365 households in barangay Camachile, Orion, in the province of Bataan, a migrant-sending village in the Philippines. The main criteria for selecting the area of study are being rural, having high migration prevalence based on data from the community-based monitoring system database of the municipality and accessibility from the capital for the feasibility of field research.